One day a chump, the next day a champion. What a difference a day makes in tournament poker. Television coverage means you can be forgiven if you believe that Texas No Limit Hold’em (NLHE) is the only form of poker. If you did, then you would be wrong, as there are multiple derivatives of the game of poker with operators like Unibet casino. 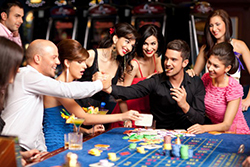 Omaha Hi-Lo is a derivative of poker that allows players to compete for both the low and high hands. It is one of the games that you can find being played in 8-Game Mix, both online and live, and here are three tips to get you started. With so many more options to choose from, starting selection in Omaha Hi-Lo can deliver a mighty headache. To simplify matters remember that your aim is to scoop the pot, which means you want to have a hand that will qualify for both the hi and the low. This makes hands like AA23 doubel suit a dream come true. Another strength to have in your starting hand arsenal are nut flush draws, as they will help you when your opponent gets it in with a worse flush draw, which will happen a significant percentage of the time. Anybody who has played a decent amount of NLHE will know that limping is generally observed as a –EV strategy. In Omaha Hi-Lo you will come across a whole range of hands where multi-way action should be encouraged. So if you are dealt a hand like A235 double-suited, in middle position, then limp away. With so many cards out of the deck, you really do have to understand the difference between playing in a heads-up pot compared to a multi-way pot. More cards means more draws and made hands, so when you are playing multi-way you need to make sure that you either have the nuts, or are drawing to the nuts. Anything else just will not do.